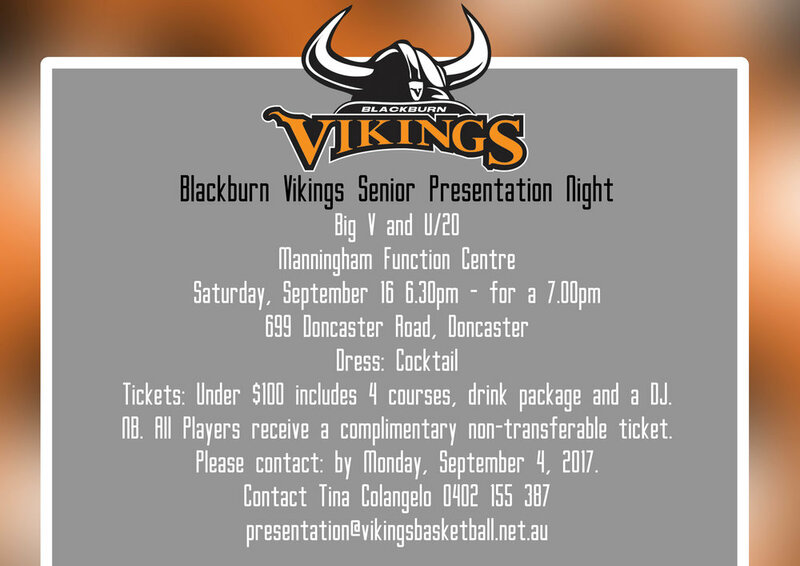 The 2017 Blackburn Vikings Big V and Under 20 Presentation Night is right around the corner. The night will take place at Manningham Function Centre, 699 Doncaster Road, Doncaster on Saturday, September 16 from 7.00pm. Drinks and canapés will be served from 6.30pm. The night will reflect on the massive year the club has had and recognise the individual achievements to those who contribute to its success. In addition to the Big and Under 20 Presentations the club will be presenting its second ever class of life members. Tickets are available for just $100 which includes a 3 course meal, drink package, entertainment and presentations. For more information or to purchase tickets please contact Tina Colangelo by Monday, September 4 on 0402 155 387 or presentation@vikingsbasketball.net.au.